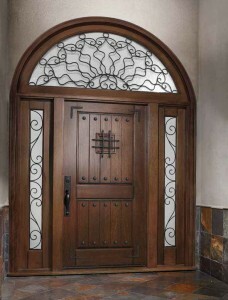 Main Door Corporation is a premier provider of luxury interior and exterior wood doors that capture the beauty of old-world craftsmanship without sacrificing the quality and sturdy construction that comes with state-of-the-art manufacturing techniques. Every door we create is made from 100 percent solid wood with no veneers. This means that all of our products, from our rustic mahogany doors to our top-of-the-line Platinum Collection, feature natural grain variations that make each one unique. And, our house doors will maintain their stunning appearance long into the future because unlike veneered products, they are ultra-durable and will never peel or delaminate. Since our founding in 1996, Main Door has been an exclusive partner with The Home Depot, making it easy for our customers to see our beautiful products in person before purchasing. Since our founding, we have continued to expand, and today we offer many different collections of solid wood interior doors and entry doors. For example, if you’re seeking a rustic look for your home’s entrance, you’ll love our mahogany speakeasy door, which features a distressed wood appearance and fully functioning speakeasy with a charming wrought iron grill. If you’d like something a little more modern, our Craftsman door, with its clean lines and classic look, might be for you. Or, for a door that combines elegant style with functionality, look to our Dutch door products, which have the versatility to serve as both a window and an entry door. No matter your needs and taste, we have the perfect option for you. Whether you choose to purchase our rustic mahogany interior doors for your home’s bedrooms, a stylish Dutch door for your kitchen’s back entrance, a large-format teak door for your grand entryway, or any of our other products, you’ll have plenty of chances to make them your own. You’ll get to choose from many different stains and finishes, sidelite styles, transom shapes, panel and glass options, and more. We can even build your doors and sidelites in custom sizes. When you choose Main Door, you’ll get a product that meets your functional requirements and reflects your aesthetic preferences. Furthermore, when you buy a Main Door product, you can have peace of mind knowing that our materials were sourced responsibly. We take our commitment to the protection of the environment seriously, which is why we are proud to be certified by the Rainforest Alliance and Forest Stewardship Council™ (FSC) for following strict guidelines for proper forest management. If you’d like to learn more about our various collections of solid wood doors, contact us at Main Door Corporation, or visit a Home Depot near you today.